The fellows from Hamburg came back with their brand new album, "T5C", in September 2014, the first to feature brand new member Phil Speiser after founding member Rick J. Jordan left to pursue his own interests. On the same day, they also released the second single from the album, "Today", featuring the vocals of Vassy, who had become known for her previous work with David Guetta that same year. First off is the standard Radio Edit, which makes no haste in throwing Vassy's vocals our way. They're alright, but nothing to write home about. Some Scooter fans have compared the melody behind part of this track to that from Lady Gaga's "Applause", and while I can see the comparison, I don't think there's a direct connection (the melody wasn't that innovative to begin with). The best part of the track is yet to come: frontman H.P. Baxxter's slow fade-in, chanting "Check out the sound, here's the rhythm, even bigger than before, if it's loud and kickin'!" Even though it's pulled directly from "Discohopping" by Kluddheads, it's fun to hear H.P. use them, too, amid some tension building in the background. Sadly, at this point, things are average at best, even with those fun shouts. And then the break hits, and that's when things take a turn for the absolute worse. onotonous and brash, there's about as much to enjoy here as there is in a zoo where all the animals are sleeping. In a nutshell, it's lacking the Scooter spirit, or any spirit for that matter. This formula repeats itself again, and really, there's nothing much new offered the second time around. Or the first time. There are a few more mixes on most digital versions of the single. The Extended Mix is exactly that: a longer version of the track, even though the extra 45 seconds don't really add anything significant. But it's the Scooter Remix that we should be paying attention to. This one's a fresh mix of house and some trance and is far more interesting than the song you'll hear on the album. Vassy's vocals are mixed with some sharper trance jabs, and H.P. 's vocals are completely omitted in favour of some jazzy electro-house buzzes and new weird samples. While not infinitely more innovative than what the original provided, it's more pleasant and entertaining for the ear. I especially enjoy the playful high-pitched voice at the 3:07 mark; that's cute. To end, we get an actual non-Scooter remix in the Crew Cardinal Remix. With a straightforward bass 'n beat combo to lead us in, Crew Cardinal doesn't stray too far from the original, using the original twangs behind Vassy's vocals and just adding minor pads. They toss in a melody that didn't get too much focus in the original under H.P. 's shouts before they break into their own jam that, while still more pleasant than Scooter's first offering, still suffers from the ailment of generic electro garble (repeated monotone notes while little variation as an acceptable instrumental chorus) from which this entire single seems to embody. 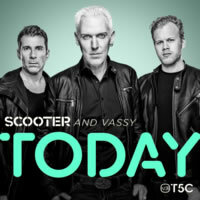 "Today" just wasn't one of Scooter's most massive hits, and there's definitely a reason why: it lacks the classic Scooter spirit, and frankly, it doesn't possess any qualities that could make the song stand out above everything else in its genre. They tried to follow a popular musical trend, and it bit them in the behind. I expect better results from a band with such a rich history. It's a shame they fall prey to the lowest common denominator to win over new fans. In the future, I hope Scooter stays true to its roots, rather than jumping on a bandwagon to try and stay relevant.